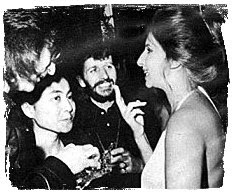 The first time three former Beatles were seen together in public after the Beatles split was on April 7, 1973, at a Fundraiser in Beverly Hills, California. The Fundraiser was for Daniel Ellsberg. Ellsberg had worked for the RAND cooperation and due to his work, he would attend anti-Vietnam War rallies in the late 1960's. After attending these, he began to believe that the war was wrong and needed to be stopped. Because of his job, he had access to what was known as "the Pentagon Papers" These papers basically stated that from early on in the war, the American government knew that there was no way the war could be won. Ellsberg made copies of these papers and sent them to the New York Times, who promptly published them. It was a big deal because they made both Presidents Johnson and Nixon look like incompetent leaders and liars. Eventually, Ellsberg confessed to being the guy that leaked the papers and his trial was set for 1973. The trial was moved to California and by April, the legal team had run out of funds. That is when the idea of holding a fundraiser came into play. At the time, celebrities weren't doing stuff like this for political reasons as they do today. But Barbra Streisand really stepped up and helped with this fundraiser, which happened to be held on Ellsburg's 42nd birthday. 200 people attended at $250 a couple. Among the famous folks there included John Lennon and Yoko Ono, Ringo Starr (no word on if he brought a date) and George Harrison. However, you will not find a photograph or video footage that shows George in attendance. Instead, George was hiding in the kitchen, successfully trying to avoid being photographed with Ringo and John as to make the appearance of a "Beatles reunion." Personally, I think this was a bit silly, but who knows what George was thinking at the time? But three of the Beatles were there and they were all on good terms with one another, even if George didn't want to be photographed. A big part of the fundraiser dealt with Barbra taking requests from people on the telephone and in person for a fee. So one phone call requested the song "People" for $1,000 and Barbra sang the song along with a piano player. 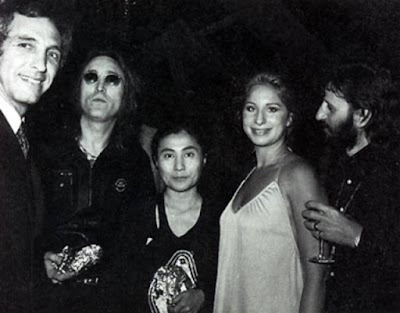 There isn't any record of John, Yoko, George or Ringo requesting a song; however one of the songs performed was "With a Little Help From My Friends." Could one of the former Beatles have requested their own number? What were the chances that they were singing along? At the end of the night, $50,000 was raised. A month later, a judge dismissed all of the charges against Ellsburg. But what a birthday party he had! Three Beatles in the same room for the first time and a Beatles song was performed. Many thanks go out to Matt at Barbra Streisand Archives for allowing me to use pieces of his original story and photographs of this event. Check out his original story for more information.